Running and jogging are excellent forms of physical exercise, which can help you maintain a healthy weight. Additionally, regular aerobic exercise can improve everything from your cardiovascular health to your overall mood. If you find running very physically tiring, you should address any issues or factors that could be slowing you down. Consult your doctor for medical advice before starting any new exercise regimen or if you are concerned about your tiredness. Unexpected tiredness during running may indicate a known or unknown medical condition. Asthma, for example, can make you tired and slow during running, because constricted breathing leads to lower oxygen flow through your lungs to your blood and muscles. Get checked out by your health care provider, and observe any preventive medical measures he recommends. For example, if you have asthma, you would likely do a regular regimen of preventive inhaler use and carrying a reliever inhaler to be used if you experience asthma symptoms during your run. Most people experience ebbs and flows in energy level throughout the day; how tired you feel may be affected by the time of day, your quality of sleep and the timing of your meals. Some people find that running first thing in the morning is less tiring than at the end of the day, while others find that the cool of the evening makes running less tiring. If you are new to running, don't overdo the intensity or duration of your sessions. 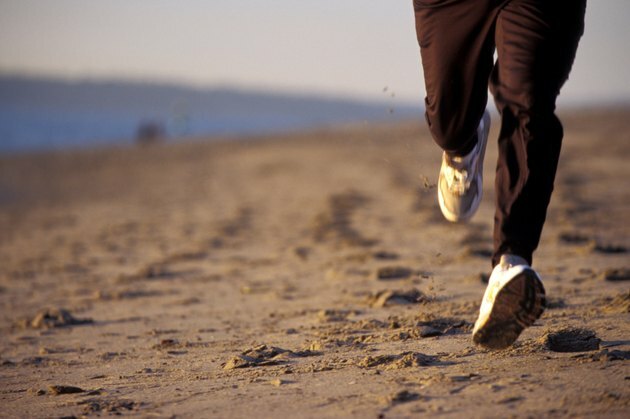 Starting with shorter runs, or a mixture of walking and running, will help you build up your endurance and fitness. Once you are settled into a regular training regimen, vary the duration of runs throughout the week. Beginner Triathlete.com recommends taking at least two rest days per week. Controlling your overall calorie intake can help you lose excess weight or maintain a healthy weight, while certain nutrients and electrolytes can help improve your overall running performance. Any extra weight you are carrying will make running more tiring. Sports drinks containing the simple sugar glucose and electrolytes necessary for muscle functioning have been proven to improve runners' performance. A study published in the "International Journal of Sport Nutrition and Exercise Metabolism" found runners went further in an hour if they had consumed a glucose-electrolyte drink before starting to run. Where you run, and what you wear while running, can significantly affect your fatigue levels. Obviously, running on steep uphill gradients is more tiring than running on flat terrain, and hard-packed surfaces such as pavement tend to be more tiring than soft surfaces. Running shoes can help prevent fatigue; most runners have some degree or overpronation or supination in their gaits, and correctly fitted, supportive running shoes can reduce gait-related fatigue. Running shoes need to be replaced every 250 to 400 miles; worn-out shoes will increase your fatigue during exercise. What Causes Leg Fatigue While Running?